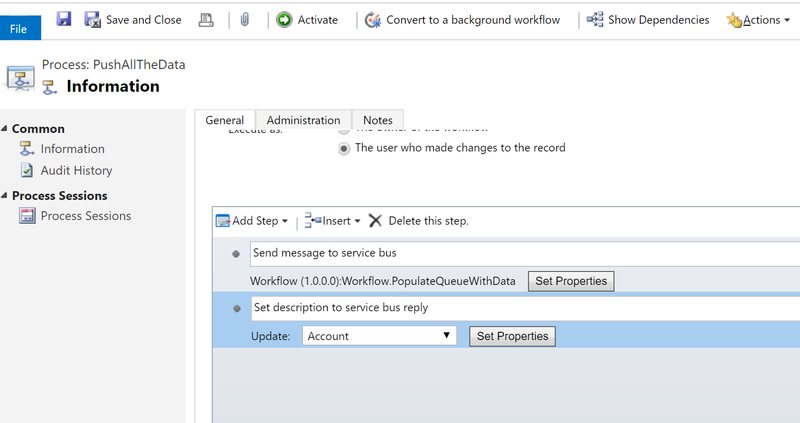 In the previous posts we've looked at using endpoints in CRM, how we can create a simply workflow to push the Activity Context to the Azure Service Bus, using queues and creating a simple one-way listener. In this post we'll focus on extending the code to enable two-way relaying, which will allow us to return data back to CRM. We'll also look at how we can integrate CRM with Azure Event Hubs, a service based on ASB which allows for a lot of throughput. The first thing we'll do is to write some more logic for our workflow, to enable us to use a return value. The relay service only returns a string, which means that we could easily push JSON or base64 through the bus to have even more meaningful feedback from the service. Be sure to remember the maximum message size for your service bus, and the timeout values. I do not recommend keeping a connection for a long time to transfer end-to-end data, but there are loads of scenarios where you'd like to get something back. OK, so what we've done here is to add an output variable to our workflow step. This allows us to take the return value and use it inside our workflow in later steps. The code looks mostly the same as it did in part2 of this series, with a couple of additions. Firstly, we assign the return value from the notification service's Execute method to a variable "result". Next we set the value of the new output variable "ReturnValue" to the result, using the execution context of the workflow. Now just build and deploy the updated workflow, and we'll head into MSCRM. Navigate to the Settings -> Processes area, and open up the workflow created earlier. Deactivate the workflow to enable editing, and then add an update step after the custom workflow step. I'm going to update the Description field on the Account to the ReturnValue from our custom workflow step. Finally, go into the plugin registration tool to update the relay service we added in part3. Make sure it's changed to a two-way relay, and eventually update the name and path if you want that. Just make sure to update the same values inside the service. To enable two way communication we first have to change our service behavior class. We have to change the interface it inherits from and add a return value. As you can see we're now inheriting from the ITwoWayServiceEndpointPlugin interface, modified the Execute method to expect a return value, and we added a return statement after printing out to the console. This means that whenever our relay service is triggered it will print out the message as before, but will also return our magic string. While this may seem like reflection and a good idea, it will only work until you've built yourself a framework to reuse across different projects/customers, and all of a sudden you're implementing several interfaces and everything stops working. For this demo, it's OK, but I'd rather specify the interface type in production code. So that's all it takes to have two-way communication working in a relay service. We've got CRM on one side, Azure Service Bus as the communication channel, and a simple console project on the other side. 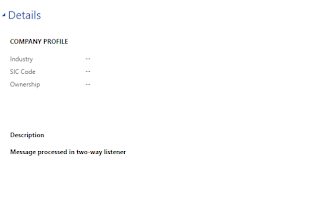 One option I haven't mentioned so far is the REST listener which can be specified in the plugin registration tool. 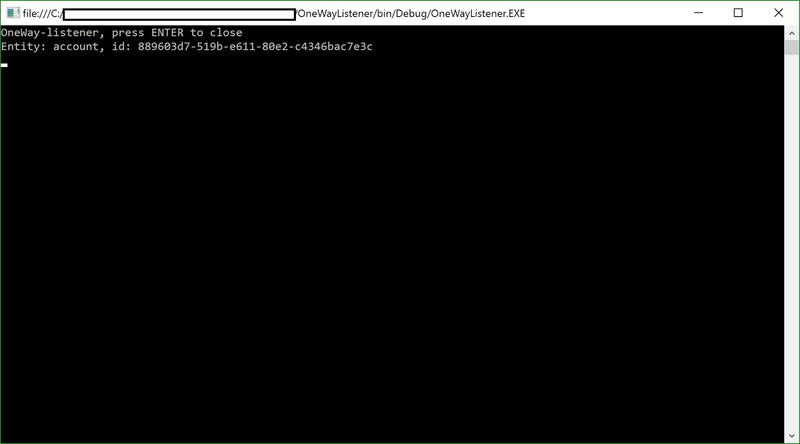 This is simply a two-way relay which uses REST endpoints instead of .Net binaries. This would allow you to create and run a relay service in Node.js, apache tomcat, powershell, IIS, or whichever web server you'd want. Just to trigger all the popular buzwords, this can enable you to use MSCRM, Azure Service Bus, and deploy node.js relay services in docker containers. Azure Event Hubs is a special kind of service bus which is designed to handle huge amounts of messages, we're talking millions of messages per second. It's probably not what you're looking at for general integration purposes, but there are several scenarios where it could benefit your company in a big way. The first thing I thought of was using this for auditing. Just write a simple workflow or plugin which pushes any creates, updates and deletes as messages to the event hub. Then you can use stream analytics or some other technology to populate an auditing system with actions performed by your users and integration systems. Anyone who's used the out-of-the-box auditing functions in MSCRM knows that processing the information is tedious, at best, and more often than not close to impossible to get any useful data from. But if you start pushing it into an external auditing system based on Azure services then you could use clever stuff like temporal tables to design a robust, maintainable system. The second thing I thought of was predictive analysis. Pushing raw data to the event hub, which allows for transfer to an Azure Data Warehouse for real-time data crunching and you have a great additional source of data that can be used for predictive analysis or (buzzword warning) machine learning. There are probably a lot of cool things you can do with this, but I won't elaborate all my ideas in this blog post. What I want to stress is the price tag. It is incredibly cheap compared to legacy systems based on clusters of servers running different messages queues with some expensive bus technology on top. And the performance is great, no matter which size you pick. It doesn't matter if you're running hundres, thousands, or hundreds of millions of messages per day, the performance is always great but there's no entry level cost, the price scales with usage. That's all for this blog series (at least for now). I might come back to visit later on when I've done some more in-the-field deployments with the ASB. 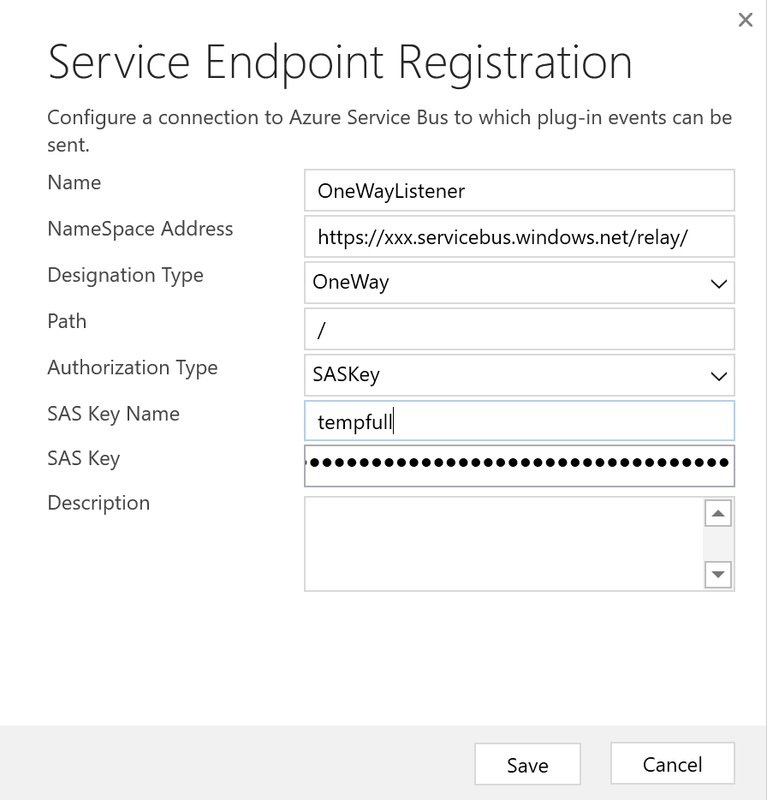 In this, third part of my blog series on using the Azure Service Bus capabilities I'm going to demonstrate how to set up a relay service and add the relay namespace as an endpoint in MSCRM. 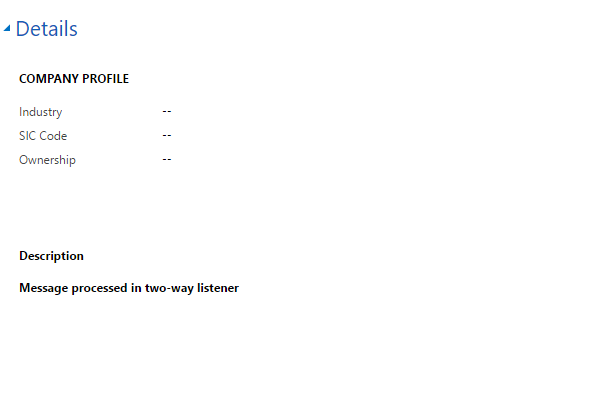 Relaying allows us to have active listeners who can either just accept messages or accept and reply to them. This allows for business critical systems like ticket reservation and receipts to ensure we're working on updated and valid data. What is a relay service? A relay service works by using the Service Bus like a kind of tunnel, in which the relay is an active listener at the other end. Unlike queues and topics, where the message is "dropped off", using a one-way or two-way (or REST) relay requires that somebody pick up the message immediately. With one-way the sender is happy as long as somebody accepts it, while in a two-way scenario the receiver has to return a value. In this post we'll start out with a one-way relay, but in the next one we'll look at how we can extend that into a two-way relay. First off we write a service behavior class. This represents the code we're running whenever a message is received. I'm just going to write out something to the console. So nothing magical happening here. 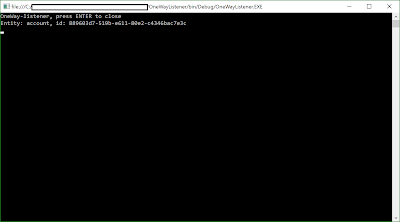 It's an extension of the IServiceEndpointPlugin, which writes the entity name and id to the console in it's execute method. Next up we go to the main method and define a servicehost variable and a new endpoint behavior. OK, so here we've got ourselves a new servicehost variable, which we'll use to add a new service endpoint, with our newly created RemoteService service behavior as the type. Then there's the endpoint behavior. We create a new TransportClientEndpointBehavior, with a shared access signature as the token provider. NB! In the SDK and the MSDN article this is specified as "Shared Secret Token Provider", but that's ACS and is no longer supported in Azure. You have to use Shared Access Signature (SAS) for authentication or it won't work. Here we add a service endpoint to the host. The type is IServiceEndpointPlugin, which is what the CRM async service sends to the Service Bus. We use WS2007HttpRelayBinding to match the source system, and we collect the endpoint from the app.config (formatted like the following: https://yournamespace.servicebus.windows.net/yourpath/ ). What's important to note here is that the path specified should not be the same as an existing path. If you have a queue or topic with the same path specified, it will be overridden and you cannot recreate it in the Azure Portal afterwards. This also means that it's up to you which path you want to use for the relay, which also means you can modify it dynamically using the web.config or in advanced integration scnearios. Finally we add the endpoint behavior we created ealier. Finally, we open up the service host connection, which makes it start listening to new messages. This means we're ready to set up the service in the plugin manager and start sending messages. First off we need to create a new shared access policy in Azure. It's the same as we did in part1, except that this time we create it on the bus itself instead of on a queue. Next up we go into CRM to edit our workflow (for more info see part2 of this blog series). The only thing we need to do here is deactivate and update the service endpoint. Then save and activate it again. I've kept the workflow running synchronously, just to be able to verify that it works as expected. Now, just to demonstrate how it looks if you've specified the wrong endpoint, or if the relay isn't running, here's the error message you get. It is the same error you'll get if you specify the path in the path box instead of in the namespace box. And that means we've successfully posted a message from our MSCRM system, through our azure service bus and out of the relay service. This example isn't very exciting, but just think of the possibilities you get if you put this service out into Azure (or on a web server if you're still into that whole old school infrastructure stuff ;) ). That's it for this blog post. 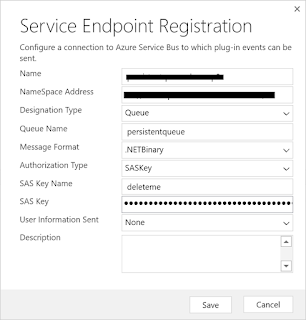 In the next and (for now) final post in this series we'll look at how we can extend this into a two-way relay, as well as integrating with Azure Event Hub which is a service based on the ASB. In part two of this blog series we're going to look at how to create a custom workflow to post messages to the Azure Service Bus queue created in part1. I'm assuming that you have basic knowledge about the C# language and that you are familiar with the custom workflow step and plugin concepts in MSCRM. First off, I have to give thanks to Jason Lattimer for all his contributions to all CRM developers and customizers everywhere. He has made available a free version of Dynamics CRM Developer Toolkit which makes building code and deploying stuff a breeze. Be sure thank him if you ever run into him. First off I've just specified a simple input parameter for the workflow step. It takes an entityreference of type (logicalname) serviceendpoint, which is the type registered through the plugin registration tool. Next is the execution content of the workflow. As you can see there's no real magic here. I'm getting the workflow context and the service endpoint notification service from the codeactivitycontext. Then I use the Execute method of the notification service, which takes a service endpoint as an entity reference, and an ExecutionContext (here in the form of an IWorkflowContext) as input. What the execute method does is posting the execution context to the provided service endpoint, which in turn means that the message received in the service bus queue contains a copy of the information contained in the execution context. This means you can add shared variables and images to supply additional information to whichever system will end up reading the message. 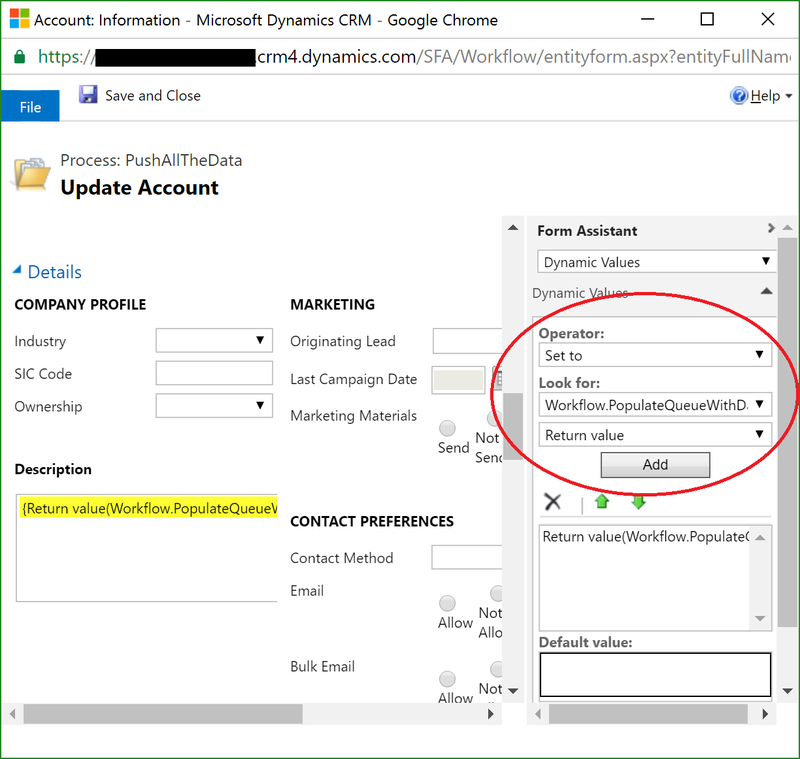 And that's it, you've got a working custom workflow step which can be built and uploaded to CRM. The next step is to start using our new workflow step inside MSCRM. Just go into Settings -> Processes and hit New to create a new process. I like to start out with a synchronous one just to make sure that everything works, and then switch to background when I know it's OK. Even though you can run this step synchronously I wouldn't do it. The network latency alone is enough to make it a bad experience for users, so I would put much effort into using it as a background WF. I've set the workflow to run on-demand, and then I add our custom workflow action as a step. 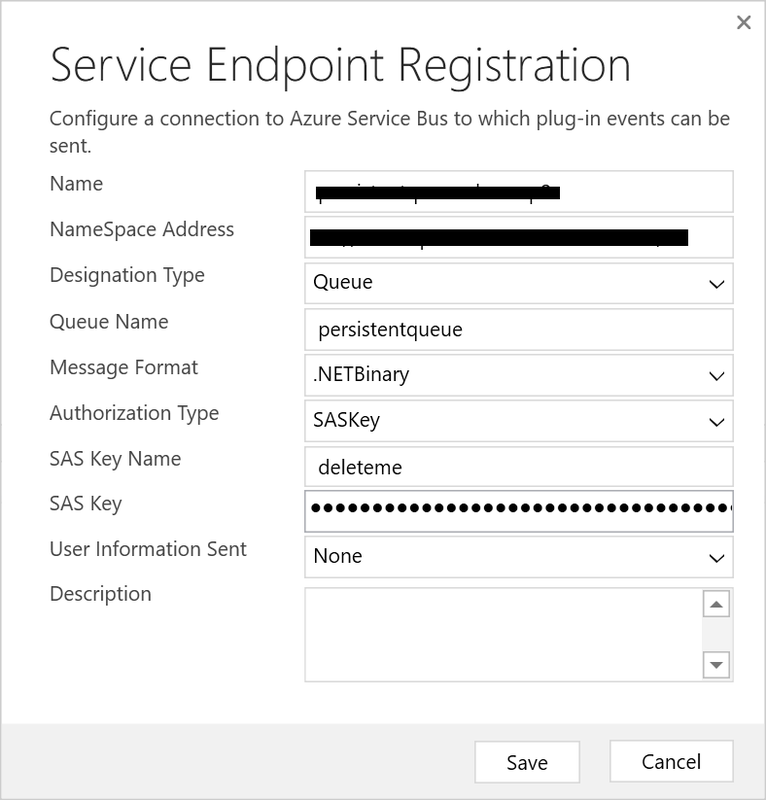 On the properties-page, search for the service endpoint registered and add that as an input to the workflow step. Now that we have configured a workflow, go ahead and save and activate it, and we're ready to start populating the ASB with messages. I went ahead and triggered the workflow 5 times, and as you can see from my Azure portal there's messages ready to be processed. The first thing I'm doing is creating a queue class using the ServiceBus sdk, and I've stored the connection string and queue path in the app settings. These strings are sensitive, so don't share them with anyone. Next I'm instantiating up a new client class, using the queue connection and the entity path, and I've set the receive mode to PeekLock. This allows me to retrieve a message from the queue without deleting it, and then I can choose to delete (.Complete()) the message or return it to the queue (.Abandon()). Then I use the receive method to get the next available (unlocked) message from the queue, and finally retrieve the message body. The message body is of type "RemoteExecutionContext", a Microsoft CRM SDK object which the notification service creates from the ICodeActivityContext. If we put a breakpoint in our code we see that we have the familiar attributes available, like inputparameters, shared variables, parentexecutioncontext, primaryentityid, etc. By utilizing the shared parameters we can add additional information in workflows or queues, which allows us to build complex logic in the queue listeners. That's it for this post. In the next one we'll look into relaying with Azure Service Bus, which allows us to send replies back to MSCRM. Todays post is kind of a wrap up from the previous Oslo Dynamics 365 meetup which was held on October 17th. We'll look into the native support for Azure Service Bus (ASB) in MSCRM and how we can use service endpoints inside our plugins and workflows. 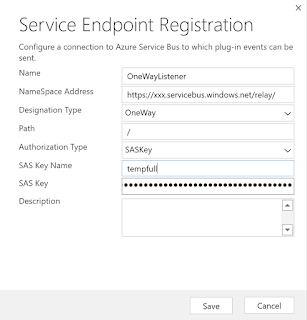 This post will focus on creating a bus, queue and access keys in Azure, and how to register the endpoint in MSCRM using the plugin registration tool. ASB is a service bus used for sending messages between different endpoints, which allows you to build and manage interconnected applications and systems without having to worry about the communication channel (within reasonable limits). 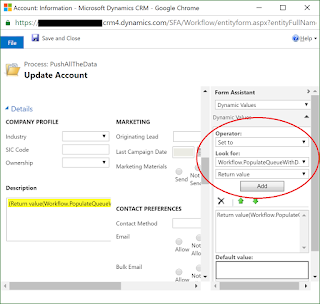 ASB supports several different destination types and communication protocols, and in this blog series I'll focus on the ones supported by Dynamics CRM. Fill in the required information to create the new resource, and hit the create button to start provisioning your brand new queue. TIP: If you're using CRM Online, optimize performance in MSCRM by creating the bus in the same location as your tenant. This will minimize latency and will be very helpful in scenarios where you use Event hub for advanced auditing or similar high-ouput situations. Now that we have a brand new service bus, it's time to add a queue to it. Navigate to Queues in the left hand navigation box and click on the [+ Queue] button. Give it a name and hit "Create" to get started. Please note that the size option is the storage size of the queue, not the message size. In my tests the messages typically were between 13 and 60kB, so a 1GB queue would hold between 16k and 77k. Even if that seems much (after all, messages are deleted after processing), remember to plan for system downtime and SLA response times. if you generate a total of 20k messsages per day then you could be looking at data loss before gets a chance to take a look at it. I highly recommend you read up on queues and how to build a robust system using ASB aside from this blog post. I'm just presenting you with a simple way to get it working, not a complete integration strategy. Now, open up your queue and navigate to Shared Access Policies. By default there won't be any policies in a new queue (there is one for the parent bus, I'll come back to that in the post about relaying), so click Add to create a new Shared Access Policy. Now you'll be asked to specify the claims added for this policy, which are "send", "listen" and "manage". Manage automatically gives the other two, but you could add a "send" access policy without "listen", and the other way around. The claims are pretty self-explanatory. Listening allows an application to read and complete messages, sending allows an application to send messages to the queue, and manage allows an application to make changes to the queue itself. I recommend a least-access-policy, ie. create seperate keys for systems that will listen and send messages, and don't overuse the keys across multiple systems. For demo purposes, using a full access key or a send&listen key is good enough. Now you have a service bus, a queue, and an access key. You're ready to integrate MSCRM with Azure Service Bus. To add a new service endpoint to MSCRM we have to use the plugin registration tool. You'll find it inside the MSCRM SDK under tools. Run the PluginRegistration.exe file and connect to your MSCRM organization. Once connected you'll have a new tab for your organization with a set of actions you can perform. Click on the register button, and then on the "register new service endpoint" option. You'll be presented with two options, either entering a connection string or starting with a blank connection window. I recommend pasting in the connection string from the azure portal, giving you a completely filled out connection settings window. Take note that you can also choose to send the UserId as a parameter as well. This allows for additional authorization checks in your processing steps, and can be very useful to help determine who did what. Now hit save, and you're done! A new service endpoint registered and you're ready to go. In the next post in this series I'll demonstrate how to write a custom workflow step to use the service endpoints. I also recommend to read up on the technologies. I'm just giving you a simple demo on how to actually do this, but there's a lot more to know and understand in order to plan and implement this successfully in your environment.